Mr. Graham really likes Linie, a smooth aquavit that is aged in oak sherry barrels. Not only is the aquavit aged in barrels, but the barrels are aged as they travel from Norway via ship to cross the equator. Linie is Norwegian for line, and it during this journey across the equator twice that the wood in the barrels lends flavor and smoothness to the aquavit. If you look through the bottle to read the back of the front label, you can see the name of the ship and the "travel" dates for the contents. Our latest bottle sailed on the ship Tysla from July - November in 2012. We are both aquavit fans. Our favorite is Krogstad Festlig, which is distilled here in Portland at House Spirits. It is bright, herbal, with a bit of welcome sweetness. In addition to sipping on its own, I love to make drinks with aquavit. It is fun to play with the herbal notes. In the spring and summer, I add fresh juice, dill, fennel, and borage to make something that resembles a garden in a glass. Mr. Graham loves to make kaffepunch with it. I will tell you how to make kaffepunch below. This time of year though, it is nice to keep it simple and make sours. 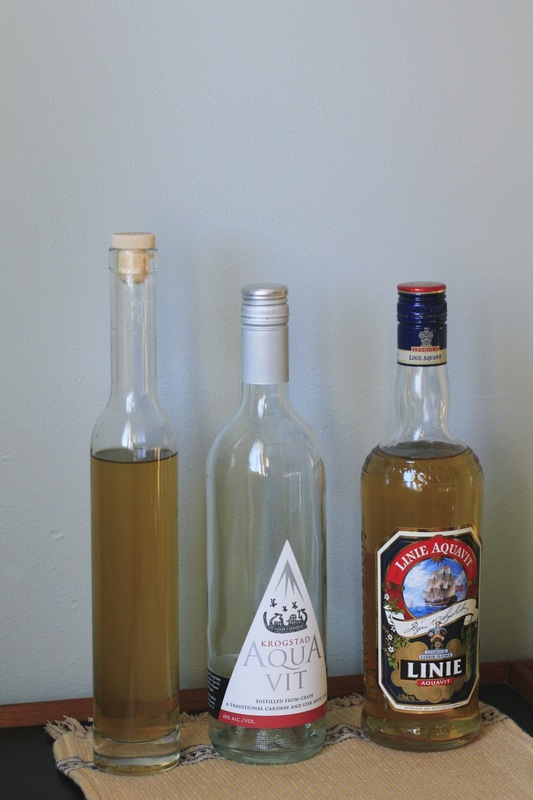 Have any of you tried my recipe for homemade aquavit? I have been so busy working on other things that I forgot that I had made some in early December. I had a few sips, and put it away in our basement bar. We have a lot of bottles around here, and I often find little surprises when I go looking for that lost bottle of something or other. Do you believe I didn’t even put the aquavit in a pretty bottle, it was still in a jar? I tasted some again and it is lovely and herbal. It is really good on its own, but then I discovered that it makes a really good sour. It is one of those cocktails that I would be happy to pay a little extra for at a swanky cocktail bar. I decided to keep it simple and not add any other liqueurs. I added some egg whites because the frothy creaminess plays well with the citrus and herbs. It also tames the fire a bit. In this experiment there were two clear winners: The Krogstad and my homemade aquavit. The Krogstad sour is fresh, herbal, and highly drinkable. The homemade aquavit sour is brightly herbal and tastes unlike anything I have ever had. I highly recommend it, but you are going to have to visit me, or follow my recipe and have one in a month. The one sour that was a dud was the one made with Linie. Linie is very smooth, so the sour was too flat. Before I give you the recipe, we are going to have to talk about raw eggs. Even though scientists have confirmed that egg whites are alkaline and are therefore not hospitable environs for salmonella, there are some precautions to take. The main culprits for bacteria are the yolk and the shell. Some bartenders use a bleach solution to rinse their eggs. I just wash mine really well with warm water. I also buy pastured eggs from small farms. You can also buy containers of pasteurized egg whites, but they don't always froth and foam nicely. If you are totally grossed out, just skip the egg whites. Before the 1980s and the sharp increase in salmonella contamination most sours included egg whites. They are not necessary, but I really love the creaminess they create. A bit about technique: I prep the egg by washing it well. I crack the egg and carefully put all the white into a cocktail shaker and make sure the lid is on tight! I put the yolk on a saucer and feed it to our kitties (although I really want to learn how to cure the yolks). I then shake the egg white really hard to froth up the white. Some bartenders recommend removing the spring coil from a Hawthorne strainer to increase the froth. It works really well, but isn't necessary. I then pour the frothed egg white into a glass. I also make one cocktail at a time in the shaker or else the force of the shaking will cause the shaker to burst and the contents will fly in every direction all over your kitchen and there will be a multitude of expletives. Water will be boiled and the entire kitchen will be scrubbed until it gleams. So no economizing, just make these sours one at a time. This makes 1 cocktail. If you don't have access to Krogstad, you can also make a gin sour with a floral, citrus, or herbal forward gin such as Hendricks, Blue Coat, or Aviation. Add the egg white to the shaker first and shake strongly to start frothing the whites. You can use a spring from a Hawthorne shaker, if desired, but it is not necessary. Add the remaining ingredients to the shaker and shake very well. Strain into a small cocktail or Nick & Nora glass. Garnish as desired. Place a clean silver coin (Mr. Graham uses a 25 øre coin) in your coffee cup. Use a demitasse cup for the best results. Add coffee until you can’t see the coin anymore. Then add aquavit until you can see the coin again. It will take a lot of aquavit! Sweeten with sugar, if desired. Hazelnuts are the underdogs of the nut world. Small and modest in appearance, they are packed with flavor. My first encounter with hazelnuts was the bags of mixed nuts in the shell that arrive in the markets in late fall/early winter. My mom would always stock up before Thanksgiving and they would last through the winter. They still remind me of winter weekend afternoons enjoying the warmth of the woodstove, the sound of football games on television, and sharing a large wooden bowl of nuts in the shell. The shells would collect in napkins and saucers strewn about the living room. We all had our favorites: The almonds with their corklike shells, the leathery brazil nuts, and my favorite, the perky little hazelnuts. I am not sure if we called them filberts or hazelnuts. My love for the hazelnut followed me to adulthood. My favorite gelato combo is still a scoop of gianduja and a scoop of nocciola. I would buy the occasional bottle of Frangelico. In fact for a long time the only booze I bought was Frangelico. When I was in my twenties I used to add it to soymilk and ice and grate some nutmeg on top - and that was the extent of my cocktail making. Even though I love the monk shaped bottle and the distinct hazelnut flavor, I was frustrated to discover that this product is not just hazelnuts, sugar, and alcohol. The rich brown color comes from caramel coloring and not from toasted nuts. I am sure there is some corn syrup lurking in there too. So now that I live in the land of hazelnuts and filberts, I thought I should start making my own hazelnut liqueur. It is much easier to make than a batch of chocolate chip cookies. Frangelico has added vanilla and chocolate flavor. I added a little vanilla bean to mine, and if you feel like adding a few cacao nibs to your batch, please feel free. The cacao nibs may cause some cloudiness and add a bit of fatty residue, so keep that in mind. Add the hazelnuts to a jellyroll pan or cookie sheet with sides. Toast for 10 -15 minutes at 350 degrees F. Every few minutes give the pan a shake to assure even toasting. Do not over toast, it is better to err on the side of under toasted. You want them to be slightly golden, not brown. When the hazelnuts are ready, remove from the oven and let them cool in the pan. When they are cool, place the hazelnuts in a large mason jar and add the vodka and brandy. Cover the jar tightly and give it a little shake. Let the mixture sit for two weeks at room temperature. The liqueur should have a strong hazelnutty flavor and scent. I smelled and tasted the mixture every few days. Add the sugar and water to a small saucepan and simmer over medium low until sugar is dissolved. Remove from heat and let cool. When the syrup is cool, add a bit at a time to your hazelnut booze mixture until it is a little less sweet than you like. Add the half vanilla bean and let the mixture rest 5 days. Strain the liqueur through cheesecloth or a coffee filter and let it rest for a few more days to let all the flavors infuse. You can add more simple syrup, if needed. If you do, allow a few more days before enjoying. This liqueur makes a nice after dinner sip, but it is also great with seltzer on ice or with your favorite milk and nutmeg. We tend to correct our Sunday coffee with it. I love cordials and liqueurs. They warm the tummy and brighten the spirit. Fruit liqueurs offer a taste of summer in the winter, and herbal liqueurs provide warmth and comfort. They are excellent in cocktails, but are also fancy on their own for a little after dinner treat. This may not seem like the best time of year to make cordials and liqueurs, but in the winter you can make them out of citrus, herbs, spices, nuts, tea, and coffee. 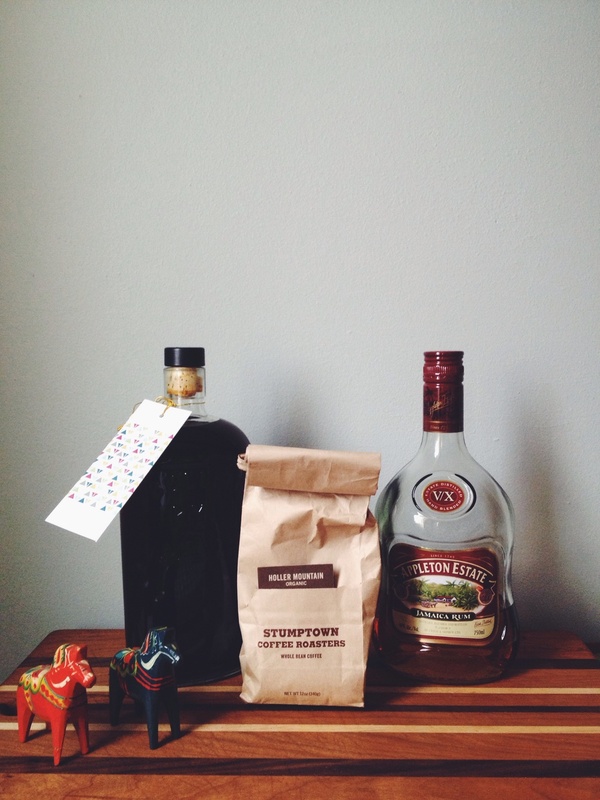 Today I want share my method for cold brewed coffee liqueur. Coffee liqueur is easy and forgiving. I used to make mine with chilled drip coffee and vodka, but I prefer making it with cold brewed coffee with a brown sugary rum like Appleton Estate V/X. Cold brew coffee is rich and flavorful, plus you can concentrate the flavor without concentrating the bitterness. This may seem like a lot of steps, but they are all pretty easy. 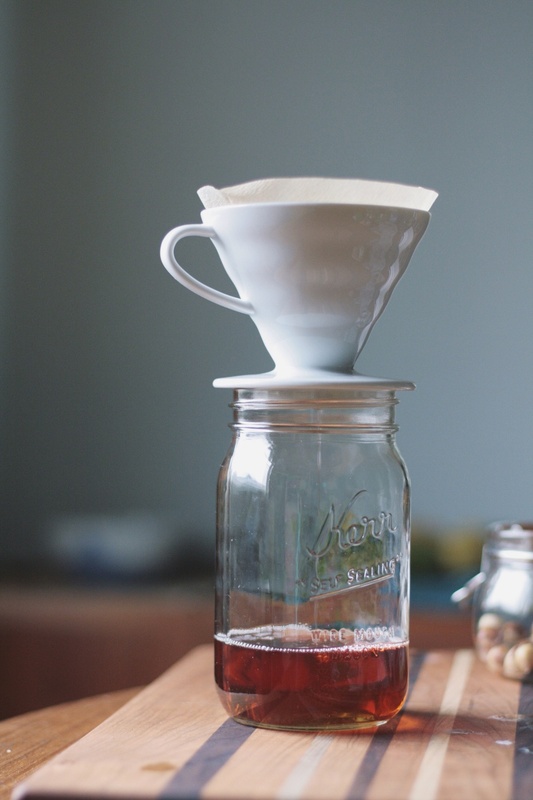 Cold brew coffee is easy, but keep in mind that it takes 12 hours to brew. Once you brew and strain it, you can keep it in the refrigerator for a few days. This recipe makes a richer and more concentrated cold brew than I normally make, but I like it to be more concentrated so it can stand up to the rum. 1.5 cups medium-coarse ground coffee. I used Stumptown Holler Mountain. I like to use a rich coffee with mocha notes. I can't wait to try it with Extracto 11 of Spades, but it may be a while before I can get my hands on some. Put the ground coffee and the water in the glass jar or pitcher; stir gently. Let it sit on the counter for 12 - 15 hours. I don't cover mine. Pour the coffee mixture through a coffee dripper lined with a filter into another jar or pitcher. Use now to make liqueur, or chill until later. Use within a week. You can also use regular granulated sugar, demerara sugar, or organic cane crystals. If you are using "regular" white sugar, you may want to add a little molasses. Please feel free to make more than you need, it is good in coffee or in cocktails. This syrup is a 1:1 ratio, so feel free to make it 1 cup of sugar to 1 cup of water. Easy peasy. Put sugar and water in a small saucepan over medium high heat. Bring the syrup to a gentle boil, stirring every once in a while. Turn down heat to low-medium and let the mixture simmer until all sugar has melted into the water, stirring occasionally. Remove from heat and cool. Simple syrup will keep in the fridge for a few weeks. Put all of the coffee into the half gallon mason jar, add 3/4 the bottle of rum or vodka, add most of your simple syrup, and the 1/2 vanilla bean. Stir gently and taste your mixture to see if you would like to add more rum, and or simple syrup. Let your liqueur sit for a few days and taste again. It really takes a week or two for the flavors to evolve. You can always add more rum, coffee, or simple syrup anytime during this process. When the flavor is to your liking, remove the vanilla bean and strain into bottles. Some folks like to run the liqueur through a coffee filter to strain out any remaining vanilla, but I don't bother. This recipe yields about 1 liter of liqueur, depending on how much cold brew, rum, and simple syrup you used. Feel free to experiment by adding a little more vanilla, a few crushed cardamom pods, or some toasted hazelnuts. Serve the cordial neat in a little cordial glass, on the rocks, in a White Russian, in a cocktail such as The Sellwood, or over a scoop of vanilla ice cream for a tasty affogato.